This is strictly for garlic lovers only and adding the red peppers gives it that extra kick. Garnish with Texas Hot Chili Olives as an added bonus. Heat oil in skillet over low heat. Stir in garlic and cook for 7-8 minutes until golden in color. Stir in red pepper, sauté, stirring about 1 minute. Cook the linguine in boiling water until al dente (6 minutes). Ladle out and reserve ½ cup of pasta cooking liquid. Drain pasta. 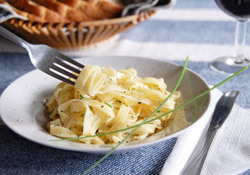 Toss pasta with garlic oil, pasta cooking liquid and parsley. Season with salt and pepper. Garnish with Texas Hot Chili Olives. This dish serves 4-5 people. Spicy!